Want a Signed Copy of WTMS? I’ve got a Spring Giveaway going on via Goodreads – Enter throughout the month of April 2016 for a chance to win a signed copy of What the Marquess Sees! I have 5 copies available! Final Round! 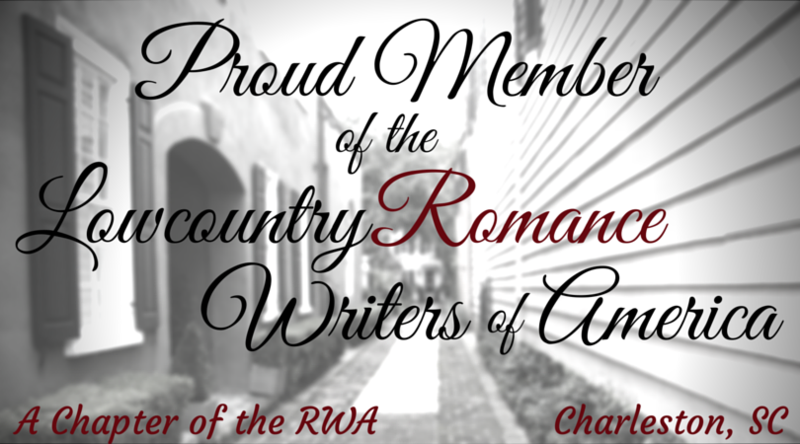 TRR Reader’s Choice – Vote Now! I’m pleased to announce that What the Marquess Sees has made it to the final round of the Romance Review’s Summer 2016 Reader’s Choice Awards. To those that voted, I want to say thank you for your nomination!! and vote for What the Marquess Sees by April 30! That’s all you have to do. You do need to log in, and you can do so using your FB account if desired. Ready to find new authors and win some fabulous prizes? Then, check out the Night Owl Reviews Spring Fling Scavenger Hunt! I’m one of the sponsors of this event, in which readers have some fun discovering new authors and new books to read. 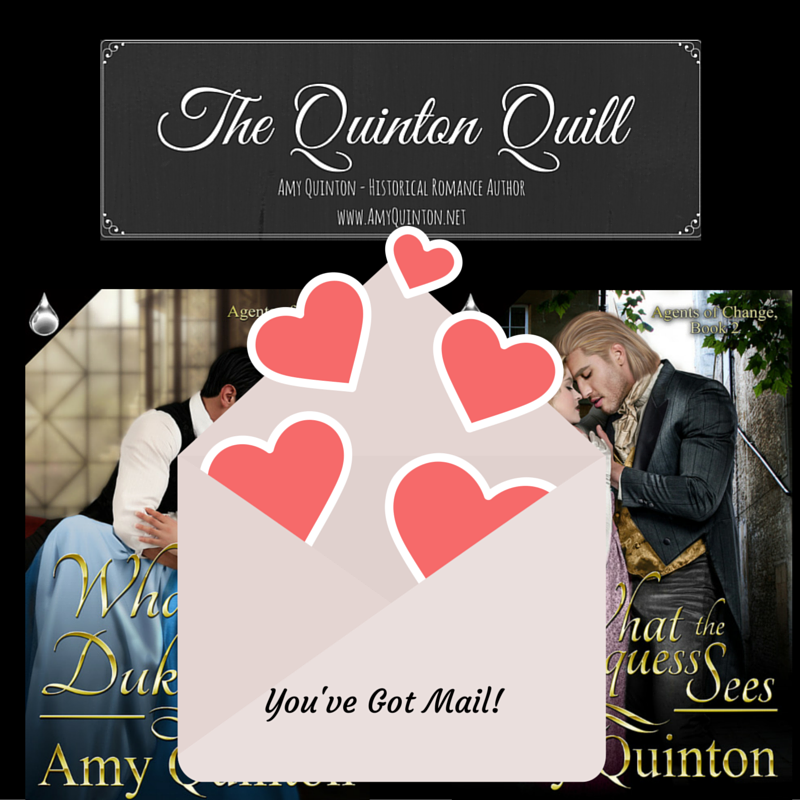 Make sure to check out my featured title, What the Duke Wants, along the way! Quoi? Mais oui, d’accord. Hello everyone! I shall begin again. I am Achille Archambault, Marquis de Saint Croix. It is my great honor to visit you in your time to speak to you of mine. Much has changed, but I believe things are still the same, non? La Cale has brought me forth and has given many very interesting books to take back with me. I found Madame Quinton’s Quoi Le Duc Desires to be most moving and informative. Perhaps this one shall seek love with an English peasant as well! (laughs) La Cale is a generous benefactor, but I believe she would not be above arranging such a ridiculous match. In my language, a cale is a kind of wedge, a tool for immobilization, and La Cale is likewise stubborn in her desires. C’est tres amusant, non? En Francais, Quinton is only Quinton, and that is not so fun, although I very much admire her works. The one about the Marquess raised a blush to even this dark complexion! If you are to journey back with me to my time, I would be most honored to accommodate you in my rooms in Versailles. Monsieur Sharpe and Monsieur Sedley have gone and there is room, and you will be happy to hear my manservant, Armand, has recently succeeded in removing the corpse smell from Monsieur Sharpe’s room. Bon! I will show you the grandeur of Versailles. You will be presented to the king and you will meet many great people, and no few dogs as well. The Duc de Languedoc is likely to attempt to take liberties, if he can remove his eyes from my virtuous niece long enough to do so. It is a beautiful place, and very refined, but it is terrible as well. If you hope to survive the court for any length of time without disgracing yourself or inviting ridicule, there are a few small rules you must know. If you come across a friend in your travels, as you are likely to do, it is fort mauvais to ask him where he is coming from or where he is going. A man must not enter a room with a button unbuttoned that his tailor intended to be buttoned. If you are in mixed company, women must not raise their skirts to warm their legs beside the fire. Do not fidget with your hat, gloves, stick, or with your hostess’ fire irons. Do not yawn, spit, take snuff, or offer your hostess the loan of your handkerchief. If someone should sneeze, it is ill-bred to say “God bless you,” but correct to say it silently to yourself while taking off your hat. It is otherwise most uncivil to remove your hat inside the house, unless you are speaking to a person of the highest quality, such as myself. Never in any circumstances sit down to a meal without your hat on, but until every guest is seated, you must keep your hat in your hand. You may go hatless in the anteroom if civility demands it. If the servant of a superior brings you a message, you must receive him standing, and remove your hat. If you have the honor of eating with the king in the field, you must wear your hat while the king alone will remain bare-headed. At supper, do not wash your hands or face in a bowl that has been used by your social superior. You must never knock on a door inside the palace. It is correct to scratch at them with the nail on your left pinkie finger, which you should grow long for that purpose. If you visit someone within the town outside of the palace, you must not scratch, but knock. If you are visiting a lady of quality, you must strike the knocker once and no more. You must never under any circumstances sit above your social superior. Unless invited or alone, it is safer to remain standing at all times. You must never discuss affairs of the state. Men may discuss hunting and horses, and ladies may discuss scandal and frocks. Discussing politics will ruin you as surely as drunkenness or debauchery. Never attempt to sit at a gaming table if you yourself are not playing. If the king offers you food, you must not refuse him, nor may you let on under any circumstances that you are having less than a splendid time. The king cannot abide misery and will stand for nothing less than gaiety at all times. These are only some of the things you must remember if you are to be a successful courtier. Forgetting any of the rules will betray you as ill-bred and ruin your reputation as swiftly as sulking or discussing politics within sight of the king. Never fear, I will tutor you on everything you must know before we reach Versailles. I suggest you read Courtin’s Nouveau Traite de la Civilite while we travel. There is much we have yet to discuss! Could you survive the court of Louis XIV? Meet Achille and travel back to Versailles in 1677 in The Long Way Home. The palace was quiet, and he imagined most of the residents were away at meals of their own, or perhaps watching His Majesty do something else inane. The enormous rooms were dim, the lesser used ones only half-lit by candles. The marble walls appeared to glow warm with some internal fire, and the gods and monsters in the oil-painted ceilings seemed more alive in the semi-darkness. Versailles was at its best when it couldn’t be clearly seen. By daylight, the rooms were too garish, too heavily embellished to be tasteful, but alone in the night, Jack could have believed he was sneaking through some secret corner of heaven. As if to underline this point, Alice’s door opened and she slipped out of the darkness like a divine vision, the only sound she made the whisper of her skirts sweeping against the door. Her dress was the deepest midnight blue trimmed with gold lace, the muted shine of the silk like a moonlit night. Her hair had been arranged carefully and ornamented with three dazzling gold stars above her left ear. She was wearing less powder than she often did, and she looked more like the Alice he knew, only dressed splendidly as a goddess of the night. She gasped when she saw him standing there, leaning in the arch of the doorway. He hadn’t realized he had done it, but some part of him must have known he needed the support to look at her. She looked him over slowly, bashfully, and her face did not reflect any of Achille’s earlier disappointment. Her eyes appeared to be a hazy gray in the dim corridor, and were so beautiful they were almost painful to look at. It was not disappointment he saw in those eyes, but something altogether more confusing. Was it guilt? Apprehension? Dear God, it might be lust. He wondered if her room was empty, and if she had tied her corset with the knot he’d shown her. He knew he could have her dress off in a matter of moments. Just one little tug and her corset would follow, and she’d be in his arms and very nearly his. Jack felt his temperature rise for the second time that night. If she was a murderer, she must be very good at it. She could have his own knife out of his boot and between his ribs before he could pull his gaze away from her lips. Alice took it without a word, flipping open a painted fan with her other hand, fanning her face as they began to walk. Jack was tempted to ask if he could borrow it for a moment. Lord knew he needed to cool down. They walked slowly together through the dim rooms, the only sound the click of his boot heels and the swish of her skirts. The candlelight gave her face a lovely, rosy glow, but he had seen enough of her that afternoon to know that every inch of her skin really was flawless. His gaze flitted once more to her peony-colored lips. He had kissed her once before. Dare he do it again? As if she could read his thoughts, Alice looked up at him and he almost tripped over his own feet. Murderer, he tried to remind himself. He cleared his throat noisily. “Y-Your shoes aren’t making any noise,” he observed, and cursed himself for the ridiculous observation. He wanted to compliment her correctly, but he was afraid he would accidentally tell her she looked like something straight out of his most illicit dreams, so instead he blurted a silly comment about her shoes. Alice didn’t seem to mind. Instead of looking at him with the pity she probably should have felt, she grinned up at him and stopped walking. She removed her hand from his arm and, to his considerable surprise, she raised her skirts to show him the lower half of her curvy calves in silver stockings. He realized after a moment it was not her legs she was showing him, but her shoes—she was wearing a pair of flat, fluffy slippers. Alice nodded enthusiastically. She raised her skirts a little further and, after she checked that no one else was around, took off running through the now empty Petite Gallerie du Roi. She stopped suddenly and the slippers kept her sliding an extra several feet through the arch into the next room. She looked back at him over her shoulder, her delight plain on her lovely face. Jack laughed, the sound echoing through the cavernous palace. Something about her running playfully made him want to go after her. The last time he had done that, he had lost control of himself completely and kissed her in the rose garden. That’s how he had ended up going to this damned supper in the first place. Still, her skirts began to shake as she ran a few more steps, and he couldn’t help it. When Alice noticed him jogging behind her, her face lit up and she took off running in earnest, tearing through the empty rooms and halls as fast as her dress would allow. He chased her through them, grinning so hard his face hurt, until they reached another hall of private apartments and he caught her. His hands closed around her waist and he spun her around in his arms, trapping her against the gold-trimmed wall. She looked slowly up at him with those devastating eyes, and he knew one thing for certain. She had let herself be caught. Great books allow one to dream…to escape from reality…for a few hours. This book transported me… mind, body, and soul… and left me savoring my time away even hours after I put down the book. I felt like I was there, in the Palace of Versailles in 1677 France, seeing the sights with my own eyes, hearing the sounds with my own hears, even smelling the smells… (which wasn’t necessarily a good thing considering the time…lol). I felt with Alice Henshawe, the heroine, and for her… I was frightened for her, happy for her, and in love with her and Jack, the love of her life. Equal parts historical fiction and historical romance, The Long Way Home offered me a fascinating glimpse into the life, intrigue, and scandal that could be found in the court of King Louis XIV in 1677 France. Jessica Cale expertly wove historical facts and customs into the narrative without detracting from the plot… and all of it was fascinating. No skimming paragraphs in this novel! …But rather than feel deprived of the characters’ time together on the page, Ms. Cale expertly uses her superior skills as an author to build the tension to the point that you are squirming and dying with anticipation for that moment to happen. As a reader, I devoured every page, my anxiety almost palpable as I waited for that perfect moment… the moment they lay eyes on each other for the first time in five years. And it was, indeed, quite perfect. Then there was the anxiety brought on by Alice’s kindness and innocence as she attempts to navigate the evil, power hungry courtiers of King Louis’s court. Will she stumble? Will she even survive? I sincerely contemplated chewing my nails as I feared what would happen. If you love historical romance, I highly recommend this book. It is the third book in the Southwark saga and all of them are excellent. You do not need to read the first two books to enjoy this one, but I recommend you do as they are every bit as wonderful as this one.